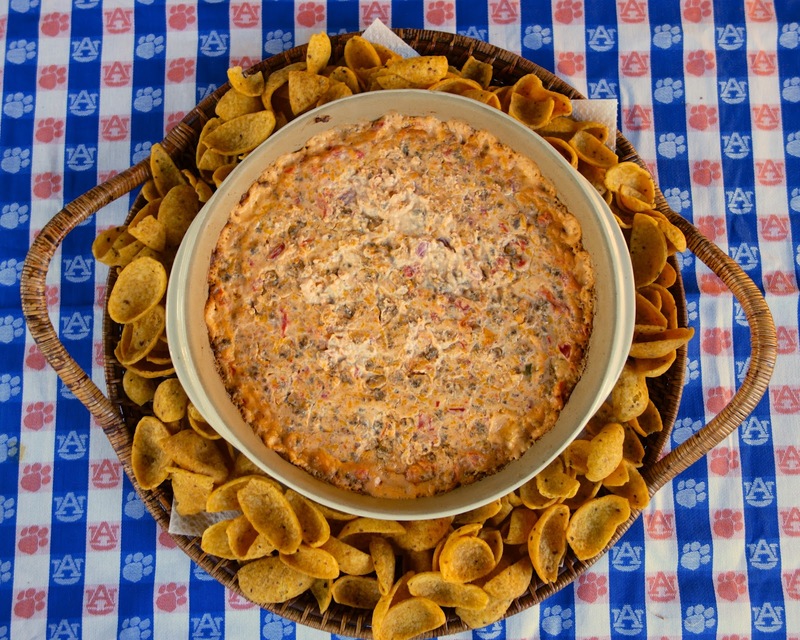 Hot Sausage Dip - always the star of our parties! Can make ahead and bake when ready. Seriously delicious!! Hot sausage, cream cheese, sour cream, cheddar cheese, diced tomatoes with green chiles. Serve with tortilla chips or corn chips. Everyone LOVES this yummy dip!! The most exciting football game of the season is coming up next weekend, The Super Bowl! I am not a huge fan of the NFL; I am more of a college football girl. My favorite part of the Super Bowl is all the new commercials and the tailgating food. I love grazing on all the finger foods and dips. I usually make a meal of it. 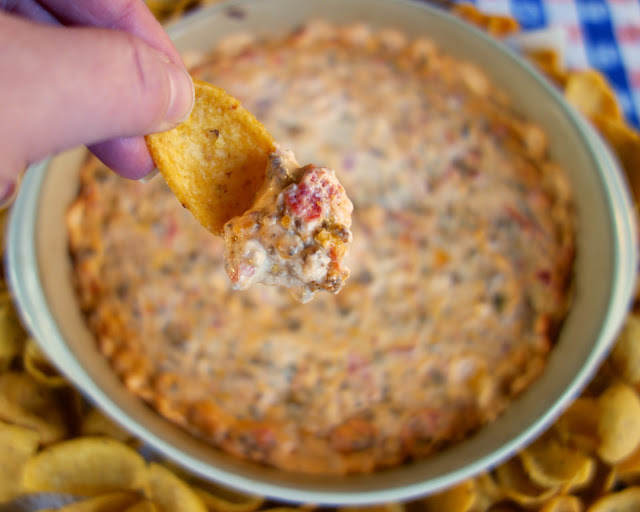 The star of this year's Super Bowl party is going to be this Hot Sausage Dip. This is one of my favorite tailgating recipes. It is always a hit, and I never have any leftovers. This recipe uses a can of diced tomatoes and green chiles and a pound of hot sausage. If you are worried this dish might be too spicy for your guests, you can adjust the heat by using regular sausage and a can of mild diced tomatoes and green chiles. I like to serve this dip with some tortilla and corn chips. You can make this dip ahead of time and refrigerate it until Sunday afternoon. I have also frozen it, and it bakes up wonderfully. If you want to bake it frozen, bake it covered for 15 minutes and uncovered for 30 minutes. So, whether you are pulling for San Franciso or Baltimore (or the commercials), I think everyone can agree this dip is a touchdown! In a large bowl, combine all ingredients and put in an 8-cup baking dish. Bake for 30 minutes or until bubbly. Serve with corn and/or tortilla chips. This sounds super good Steph - hard to beat sausage and cheese mixed together. I accidentally bought some hot sausage yesterday and didn't know what I was going to do with it. Perfect! I know that this dip is incredible! I add some spinach to mine. I make this for get-togethers and it is always gone. Love your blog! You have the best recipes! These both look yummy - thanks for sharing! This looks super easy and super delicious. Think I'll make it for the big game. Oh this sounds so good. Who needs chips, I could just use a spoon! Made this today for a birthday party. So easy to make and so delicious. Everyone who tried it raved about it. My step-brother told me that I can make it for any future get togethers. can you make it in a crock pot?